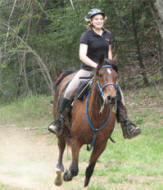 We are pleased to offer a new first class Riding Lesson Program at Leatherwood. Our Friendly Instructors are eager to help you reach your equine goals. Whether you want to simply learn the basics and feel more comfortable around a horse or build on skills that you already have, we are here to help. Lessons are offered “RAIN OR SHINE” as they are conducted in our show arena or under the covered riding pavilion. For the younger kids (ages 2 & up) and timid adults, we now offer a lead-line rides. This one-on-one ride will be given by a trained handler in a controlled environment on a well seasoned docile horse. Bring the kids for a great first experience that will last a lifetime.